Background: There is limited information available on the clinical profile of asthma patients reporting at teaching hospital. Objective: The objective was to evaluate clinical profile of bronchial asthma patients reporting at teaching hospital. Materials and Methods: A prospective study of bronchial asthma patients over 15 years of age was conducted at Mahatma Gandhi Medical College and Hospital, Jaipur over a year (July 2010 to June 2011). Asthma was diagnosed on detailed history, clinical examination and spirometry having obstructive pattern with reversibility showing increase in forced expiratory volume in 1 st sec by 12% and 200 ml from prebronchodilator value. Besides demographic data, smoking habit, atopic symptoms, and family history suggestive of asthma also collected. Results: Total, 151 cases of bronchial asthma included. Maximum were male (80.8%) and urban (65%). Most cases (52.9%) were in age group of 16-30 years followed by 32.5% in 31-45 years. More than half (55.6%) belonged to the middle class in society. Majority (74.2%) were nonsmokers. Most common symptoms were cough, wheeze, and breathlessness 98.7%, 90.1%, and 88.1%, respectively. Nocturnal awakening was present in 2/3 rd cases. Rhinitis (65%) was most common associated condition. Almost equal number of cases had seasonal and perineal pattern of symptoms, with increased severity mainly in autumn (n = 53) and spring (n = 42). Family history of atopy was present in 1/3 rd patients. Nearly 3/4 th cases were newly diagnosed, and 1/4 th were previously diagnosed. More than 50% of these newly diagnosed asthma cases belonged to moderate severity grade. Among previously diagnosed cases (n = 40), spirometry was used in only 20% cases for diagnosis of asthma, and only 20% had their asthma under control at the time of reporting. Conclusion: Asthma is a disease of young age, with rhinitis as most common associated co-morbidity. Spirometry is poorly used by practitioners in diagnosing asthma with poor control of asthma among previously diagnosed cases. This reflects a lack of awareness of use of spirometry for diagnosis and inadequate advice of treatment. Background: Bronchial asthma (BA) and allergic rhinitis (AR) are chronic inflammatory disorders of the airways. The allergic response is driven by the production of different immunological effector cells cytokines like interleukin-5 (IL-5) and IL-6 among others. Subcutaneous allergen-specific immunotherapy (SCIT) modifies basic immunological mechanisms, reducing IL-5 production. The effect of SCIT on levels of IL-6 is undetermined. Objective: The aim is to study the changes in immunological parameters that follow SCIT in patients suffering from BA and/or AR. 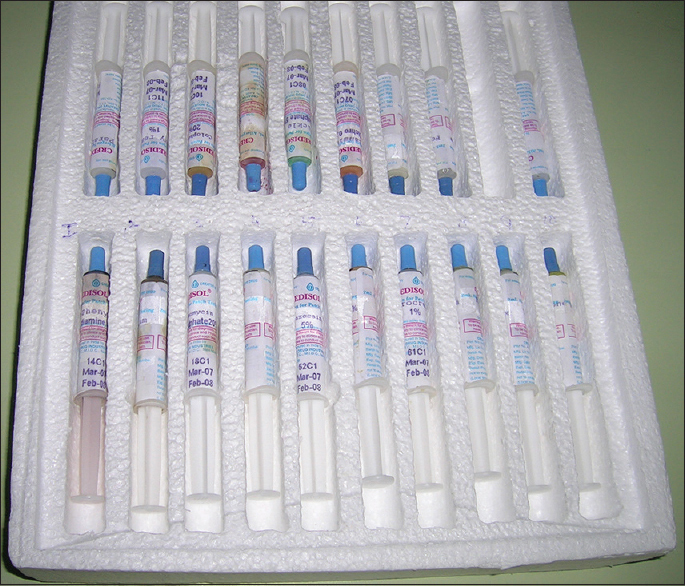 Materials and Methods: Twenty-nine patients (18-48 years, mean 25.5 years) diagnosed with BA and/or AR were evaluated for allergic sensitivity using skin prick test (SPT). The patients were started on standardized treatment for BA and AR as per global initiative for asthma and AR and its impact on asthma guidelines, respectively. SCIT was initiated as per the standard Indian guidelines. IL-5 and IL-6 levels were obtained at 0, 3 and 6 months during the course of SCIT and the response was evaluated using Friedman test. Results: Twenty-nine patients; 16 males and 13 females were evaluated and initiated on SCIT. The decreasing order of antigen sensitivity on SPT was mosquito (65.5%), housefly (58.6%), female cockroach (58.6%), male cockroach (48.2%), moth (34.4%) and house dust mite (17.2%). 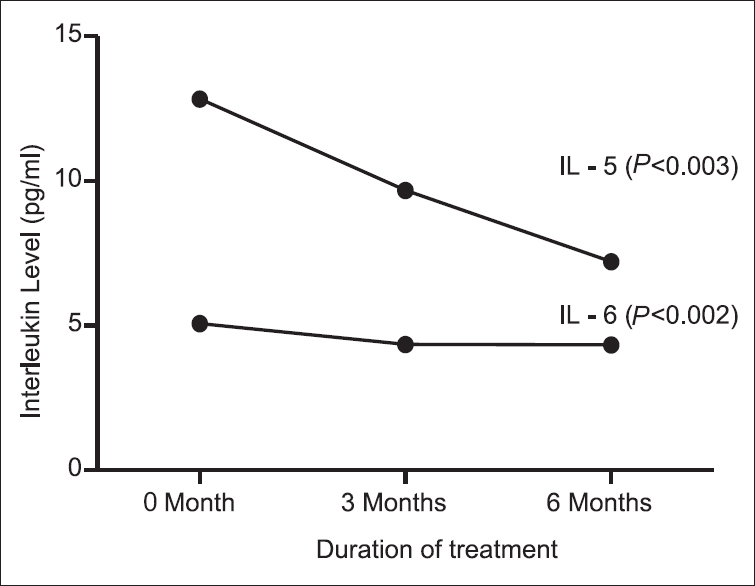 The IL-5 and IL-6 levels, for 0, 3 and 6 months were compared, and it was noted that with an increase in duration of treatment, the levels of inflammatory markers significantly decreases (P = 0.003). On comparison, the inflammatory response between male and female, duration of symptoms and number of positive antigens was not statistically significant. Conclusion: Immunologic changes associated with immunotherapy are complex and allergic patients suffering from asthma, and/or rhinitis showed a significant reduction in levels of inflammatory markers. Background: Despite the development and propagation of guidelines for the diagnosis and management of asthma, a gap remains between current recommendations and actual practice. Objectives: To assess the paediatrician`s attitude towards asthma guidelines and their adherence to its recommendations. Materials and Methods: 131 pediatricians engaged in direct childhood asthma care in state of Rajasthan were subjected to a self-administered questionnaire with 50 questions of which most were multiple choices, aiming at assessment of three important aspects about the involved pediatricians; paediatrician`s knowledge, practice and attitude. Results: Agreement with asthma guidelines was present with 87% of the studied pediatricians, however those who are not in agreement with the guidelines claimed that this was mainly due to patient factors and low socioeconomic status. Poor knowledge was found in 37%, poor practice in 49% and poor attitude in 19% of the studied physicians. Our study revealed that proper prescription of corticosteroids was carried out by only 56% of pediatricians. Significant number of doctors prescribed antihistamines, antibiotics and dietary restrictions on all asthmatic children and nebulisers/inhalers remained under-used. Pediatricians relied commonly on journals, company brochures, and conferences to keep themselves updated. Conclusion: The attitude of the majority of the studied pediatricians revealed agreement with the guidelines, while the disagreement was mainly explained by the poor socioeconomic standard of the patients. The degree of poor practice is more marked than that of poor knowledge or poor attitude reflecting resources limitations and application obstacles in the pediatricians's practice. Background: Under-treatment of asthma in pregnancy can result in adverse fetal and maternal outcomes. The potential risk of teratogenicity may limit prompt and adequate management of medical disorders in pregnancy. Objectives: The objective of this study was to investigate the physicians' prescribing pattern, their perceived safety of asthma medications and management of asthma during pregnancy in obstetric care units of a developing country. Materials and Methods: A self-administered questionnaire containing case vignettes and multiple choice questions were used to evaluate the physicians prescribing practices, their perceived safety of medications and approach to asthma management in pregnancy. Result: Of the 144 doctors that participated in the study; 76 (52.8%) would prefer inhaled long-acting β2 agonist and inhaled corticosteroids combination (LABA/ICSs) while 10 (6.9%) would prefer leukotriene antagonists (LTA) as a controller medication in the first trimester of pregnancy. Short-acting β2 agonists, LABA, and theophylline were perceived to be safest throughout pregnancy, corticosteroids and cromoglycates were considered unsafe in first trimester while LTA were considered unsafe in all the trimesters by a majority of respondents. To gain asthma control in a patient already on low dose LABA/ICS, 94 (65.3%) of the doctors would refer their to a respiratory specialist instead of increasing the dose of LABA/ICS. Less than half (42.3%) were willing to address medication compliance in nonconforming patients. The majority (72.2%) of the doctors' self-reported nonadherence to the asthma treatment guideline. Conclusion: Even though, most of the physicians caring for pregnant women seem to prefer LABA/ICS combination for asthma control, there exist a knowledge gap in the stepwise management of asthma, perceived safety of most asthma medications and tackling poor medication adherence. Purpose: Hypersensitivity to fruits and vegetables is assumed to play a role in the etiology and deteriorating of asthma symptoms in some patients, little is known about allergy to some fruits and vegetables in patients with asthma. The purpose of this study was to identify probable sensitization to eggplant, Shiraz grape, melon, and mango in patients with asthma. Materials and Methods: The study included 50 patients with moderate to severe persistent asthma and 50 healthy individuals with no history of asthma and atopic diseases. Skin tests were performed in both patient and control group with fresh eggplant, Shiraz grape, melon, and mango as well as the commercial extracts of mango and melon. Results: Among patients with asthma, the most frequent positive skin tests were to eggplant (48%), fresh melon (30%) and extracts of melon and mango (18% for each) which all were significantly different from the control group. Skin sensitization to Shiraz grape and fresh mango showed no difference to control group. Skin tests of 21 patients (42%) were negative to the all tested allergens. Conclusion: Forty percent of our patients had clinical symptoms to eggplant and more than half of those revealed positive skin tests to a fresh extract of this plant. Objective: To compare the mean Glycosylated haemoglobin level and lipid profile of children using high dose ICS with that of children using low dose ICS. Study Population: Children between 1-12 years attending asthma clinic using high dose and low dose inhaled corticosteroids. HbA1c levels, Fasting blood sugar and Lipid profile of children in the two groups were measured Results: Children belonging to low dose ICS group were using a mean dose of 206.02 ± 67.13 micrograms per day and high dose group were using a mean dose of 444.61 ± 70.33 micrograms per day. The mean glycosylated haemoglobin level was 6.206 ±1.36% among children using low dose inhaled steroids and 6.013 ± 1.185% among children using high dose inhaled steroids. The mean fasting cholesterol was 180.39 ± 28.66 mg/dl in the low dose ICS group and 179.17 ± 30.21 mg/dl in the high dose ICS group. The mean high density lipoprotein levels were 50.8 3 ±11.05 mg/dl among children using low dose inhaled steroids and 53.37 ± 13.36 mg/dl among children using high dose inhaled steroids. The mean low density lipoprotein levels were 111.78 ± 25.39 mg/dl among children using low dose inhaled steroids and 108.01 ± 30.26 mg/dl among children using high dose inhaled steroids. Conclusions: There was no statistically significant difference between the glycosylated haemoglobin levels, fasting blood glucose levels and fasting lipid profile between children on low dose inhaled corticosteroids and high dose inhaled corticosteroids. Introduction: Airborne pollen data varies from place to place due to floristic diversities in a geographical region. In Delhi, a variety of trees, weeds, and grasses produce a variety of pollens, and climatic conditions are also known to affects the pollen concentration. Aim: This study was designed to describe the prevalence of pollen in North Delhi region during the year 2013-2014. 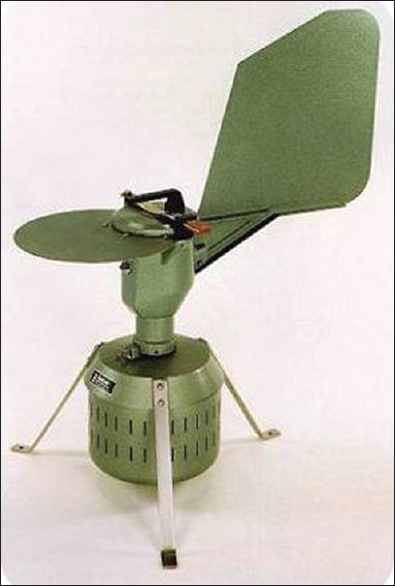 Materials and Methods: Atmospheric pollen was collected on daily bases by using Volumetric Burkard (UK) 24 h air sampler with the speed of 10 L/min airflow. Pollen was counted with light microscopy (Olympus, Japan) and the average monthly pollen count was studied from May, 2013 to April 2014. Results: A total of 42,232 pollens were collected for 1-year (2013-2014). The maximum and minimum pollen was counted for year 2013 in the month of September (4805 pollens) and December, (1973 pollens), respectively. The average pollen concentration started increasing in the year 2013 from the months of May to June (239.33, 279.38 pollen/m 3 /month) and started falling in 2013 in months of July to August (227.47, 148.60 pollens/m 3 /month). The pollen concentration again started increasing in year 2013 in the months of September, October and November (282.65, 275.73, and 245.44 pollens/m 3 /months) and started declining in December 2013 till the months of next year 2014 January, February, (131.53, 133.82, 139.56 pollens/m 3 /months). An increase in pollen concentration was noted in 2014 in the months of March and April (274.31, 263.75 pollens/m 3 /month). The humidity correlated significantly with the average pollen count in the year 2013 in June (P = 0.025, r = −0.556), July (P = 0.00, r = −0.848), August (P = 0.033, r = −0.552), September (P = 0.007, r = −0.627) and October (P = 0.001, r = −0.755). The average temperature correlated significantly with the average pollen count in 2013 October (P = 0.042, r = −0.530). Conclusion: The current study provides a preliminary data of pollen count in North Delhi region. The results will provide information to the allergy practitioners in order to advice avoidance of exposure to allergens. Context: The true incidence of allergic contact dermatitis (ACD) in a society is very difficult to estimate since its diagnosis depends on several factors. Patch testing is a useful tool to detect the allergens and improve the quality of life. Aims: The study was undertaken to determine the clinical pattern of ACD and find the causative allergen using patch test at a Rural Tertiary Care Center. Settings and Design: A 1-year study of 60 patients suspected with ACD was carried out at the Department of Dermatology. Demographic variables, clinical history, and examination were carried out. Subjects and Methods: Patch testing was done after a week of subsidence of active eczema utilizing the Indian Standard Series containing 20 allergens. Results were read on 2 nd and 3 rd day. Grading of the reactions was done based on the International Contact Dermatitis Research Group guidelines. Statistical Analysis Used: Descriptive analysis was used. Results: Of 60 patients, 60% were males and 40% were females. The most common site affected was hand in 56.66% followed by head and neck in 33.33% and feet in 21.66%. Positive result to patch test was seen in 51.33% patients. 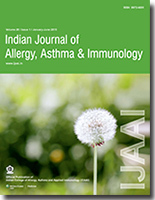 The most common allergen was Parthenium in 23.33% patients followed by fragrance mix in 11.66% patients. Grade 1 positivity was seen in 73.91%, 17.39% showed grade 2, 7.24% showed grade 3, and only 1.44% showed grade 4 positive reaction. Conclusions: In this era of urbanization and cosmetics, it is very important to keep the provisional diagnosis of ACD in all suspected cases of eczema, and a patch testing should be recommended. It helps in saving healthcare resources and decreasing the financial burden. Such studies at a large scale will help in establishing the prevalence of particular allergen in that area and help in spreading awareness in the community. Hereditary angioedema (HAE) is a debilitating disorder that can substantially impair quality of life. Three types of HAE are described in literature. Women are particularly prone to attacks due to multiple estrogen-related triggers. Abdominal involvement in angioedema is often a challenge to diagnose. Recurrent or acute onset abdominal pain can be the only presenting symptom, and misdiagnosis may lead to unnecessary surgical intervention. Clinicians need to be familiar with the types and presentations of the various types of angioedema. The knowledge about new, effective, and safe therapies, along with an increased awareness of HAE and its related concerns should help clinicians in providing optimal treatment to their patients and avoid unnecessary surgical interventions. 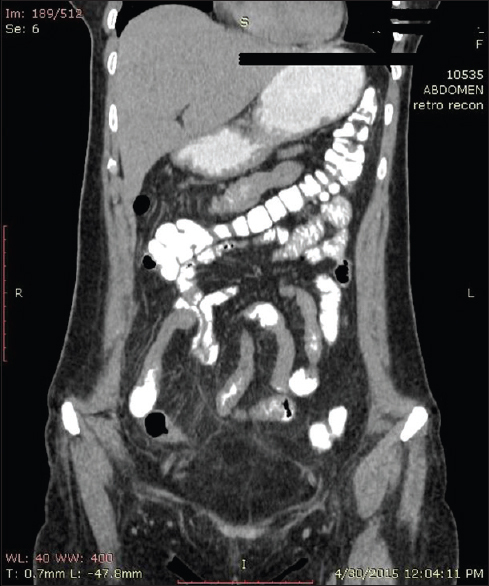 We report a sporadic nonfamily case of HAE type III presenting as recurrent abdominal pain with intestinal obstruction in women with primary infertility.